The Cold War period saw dramatic developments in science and technology, coinciding with the flourishing of the science fiction genre. 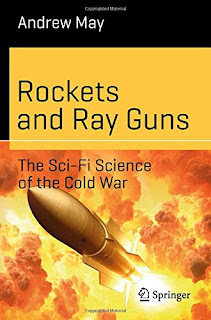 In Rockets and Rayguns, Andrew May draws on the parallels between reality and fiction, each influencing the other. Inevitably a major Cold War theme was the threat of nuclear war, and May opens with the bomb. It's fascinating that fiction got there first - nuclear weapons were featured in science fiction when many physicists were still doubting the practicality of using nuclear energy. Of course, it's a lot easier to simply take a concept and dream up a weapon than it is to make it for real - for example, H. G. Wells' prophetic nuclear bombs from his 1914 The World Set Free were nothing like the real thing. And some science fiction devices concepts - notably ray guns and force fields - came to very little in reality. However this doesn't prevent the parallels being of interest. May gives us a mix of the science - describing how nuclear weapons work - and the fiction, with exploration of the work of both well-known writers like Wells and more obscure contributors such as Cleve Cartmill. With the bomb covered, the book moves onto space travel - reflecting on the big surprise of reality being the decades of very little happening after reaching the Moon - following up with computers and robots, military applications in space (timely as the US President announces the setting up of a space defence force), the attempts to make use of mental sciences (surely driven to a significant degree by the frequency that telepathy etc. appeared in the science fiction of the time) and the 'weird science' of UFOs and psychic spies. Towards the end of the book, May asks the question of whether Cold War science fiction was reactive or proactive. Almost inevitably, the answer is 'Both'. Science fiction reacted to events (it's notable for how long science fiction illustrations portrayed space rockets as variants on the German World War II V2 rocket), yet SF also had the freedom to imagine future technologies that in some cases would come true, in others would be off on a dead end side road to nowhere. I've rated the book as four stars as an enthusiast for both science and science fiction - it's the intersection of the two here that makes the book really interesting - without the dual interest, it would be three stars. For me, the standout chapters were the ones on the mental sciences and the weird bits - but there's plenty of meat too in the more mainstream material. A solid contribution to the history of science fiction and its relation to the real world, alongside a reminder of Cold War technologies that now seem like something from a very distant past.